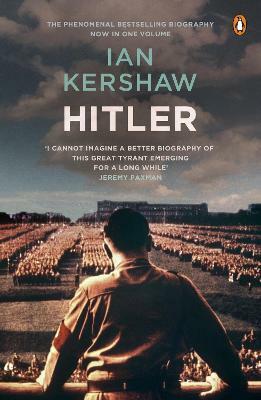 Now available in a single, abridged paperback, Ian Kershaw's Hitler is the definitive biography of the Nazi leader. Ian Kershaw's two volume biography, Hitler 1889-1936: Hubris and Hitler 1936-1945: Nemesis, was greeted with universal acclaim as the essential work on one of the most malign figures in history, from his earliest origins to the final days of the Second World War. Now this landmark historical work is available in one single, abridged edition, tracing the story of how a bitter, failed art student from an obscure corner of Austria rose to unparalleled power, destroying the lives of millions and bringing the world to the brink of Armageddon. Ian Kershaw (b. 1943) was Professor of Modern History at the University of Sheffield from 1989-2008, and is one of the world's leading authorities on Hitler. His books include The 'Hitler Myth', his two volume biography Hitler 1889-1936: Hubris and Hitler 1936-1945: Nemesis, and Fateful Choices: Ten Decisions that Changed the World, 1940-1941. He was knighted in 2002. IAN KERSHAW is the author of Hitler 1889-1936: Hubris; Hitler 1936-1945: Nemesis; Making Friends with Hitler; and Fateful Choices: Ten Decisions that Changed the World, 1940-4. Hitler 1936-1945: Nemesis received the Wolfson History Prize and the Bruno Kreisky Prize in Austria for Political Book of the Year, and was joint winner of the inaugural British Academy Book Prize. Until his retirement in 2008, Ian Kershaw was Professor of Modern History at the University of Sheffield. For services to history he was given the German award of the Federal Cross of Merit in 1994. He was knighted in 2002 and awarded the Norton Medlicott Medal by the Historical Association in 2004. He is a Fellow of the British Academy.